There are a few things here in the Pocono Mountains that start to signal the end of summer. The weather starts to cool down a bit, the kids start to gear up for school but before any of that can happen, there is one event that we at Ledges Hotel look forward to and it is the Wayne County PA Fair. When you think about fairs, especially the Wayne County PA Fair, you have a sense of nostalgia from when you were a kid and when you went to the fair. There is something about a great fair that is just fun and exciting. Come check out all the great times you can have at this year’s Wayne County PA Fair. 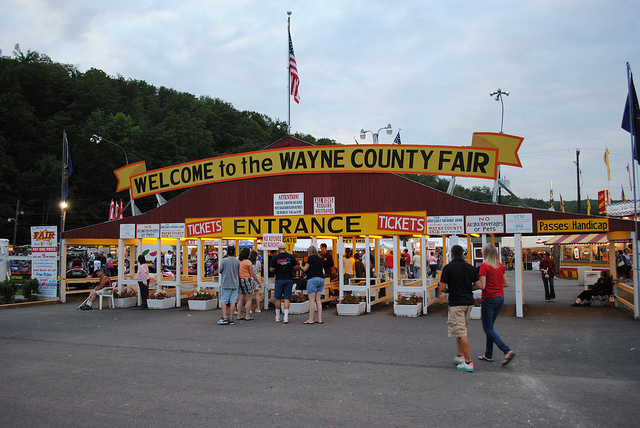 This year will mark the 153rd Wayne County PA Fair and will be held on August 7th-15th at Wayne County Fairgrounds in Honesdale. Tickets for the Wayne County PA Fair are a steal at $10 a day per person. This price includes admission to most of the grandstand shows, parking, and rides. There are more ticket options available and more information can be found on their tickets page. Let’s start first with entertainment. As you will be able to see on their website, the Wayne County PA Fair has a ton of entertainment lined up for guests. Some of the events include a concert by Chase Rice and tickets for that will be charged separately. Some of the other events during the Wayne County PA Fair are horse pulling, demolition derby, kids pedal pull, and a few monster truck shows. Another wonderful musical act that will be performing at the Wayne County PA Fair is Sour Bridges. This band features two locals, Bill and Matt Pucci, who left to pursue their musical career and it paid off. Be sure to bring your dancing shoes to this concert. Following it will be a wonderful fireworks display. Another aspect of the Wayne County PA Fair to enjoy are the contests. Locals from all around the Pocono Mountains area come to show off their best and enter into one of the many contests that are available. Some of them include baking contests, apple pie contests, as well as many livestock competitions. Some of the types of animals that you could see at the Wayne County PA Fair are cows, goats, sheep, pigs, and more. This is always an interesting thing to see as farmers are very competitive and enjoy showing off their cattle. Of course, we can’t mention the Wayne County PA Fair without also talking about the rides and the food. As always, they will have rides that are perfect for children and adults. You might be pleased to see some of the very same rides you rode as a child that are still in use today. Be sure to go the Wayne County PA Fair with an empty stomach because you will love the food that they have there. However, it may not be the healthiest but deep frying something always makes it better. As you can see, we love the Wayne County PA Fair. It’s a great time to come out and celebrate what makes our area in the Pocono Mountains so amazing. It’s also a great reason to visit. When you do decide to come to the Pocono Mountains, we hope that you will consider staying with us at Ledges Hotel in Hawley. We have so many fun things to do here and are conveniently located to many other area activities. Locals and visitors love coming to our hotel for not only the fun contemporary vibe it has but also for our outstanding service. You can see it whether you have a room in the hotel or just simply grab dinner and drinks at our in-house restaurant, Glass. Contact us today and come visit the Pocono Mountains. Want to find our more about Hawley and the Pocono Mountains? Request your free Vacation Guide today!